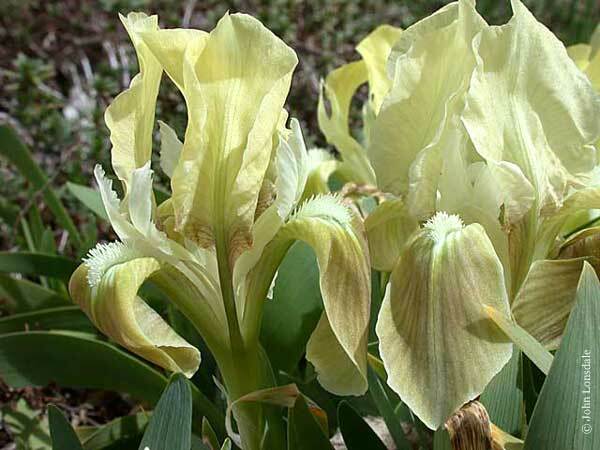 On this page we are listing bearded iris that do not have seeds with a fleshy appendage. 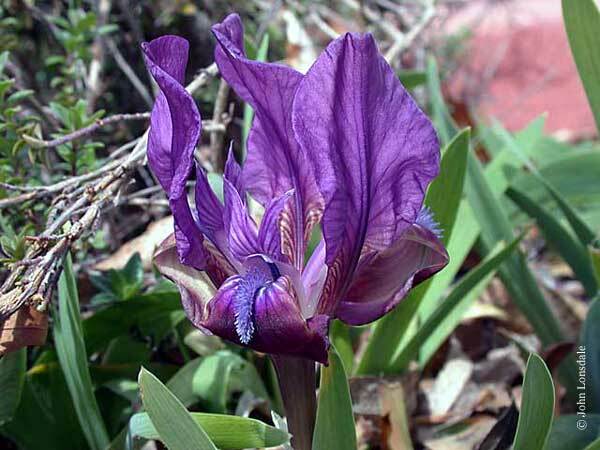 Most belong to the subgenus Iris and include plants with a stout rhizome, fans of leaves, and falls with a distinct beard. Flowering stems are simple or branched and falls and standards well developed. 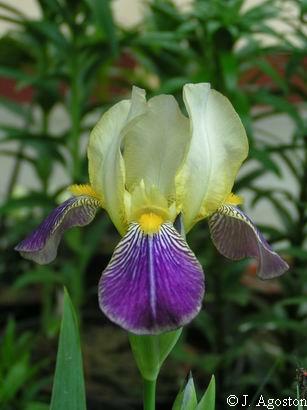 Iris × albicans is a natural or ancient hybrid from Yemen and Saudi Arabia. 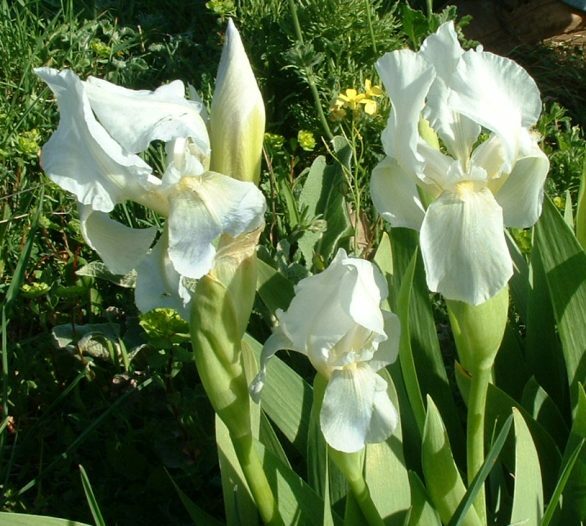 It has fragrant pure white or blue flowers with a white beard tipped yellow. 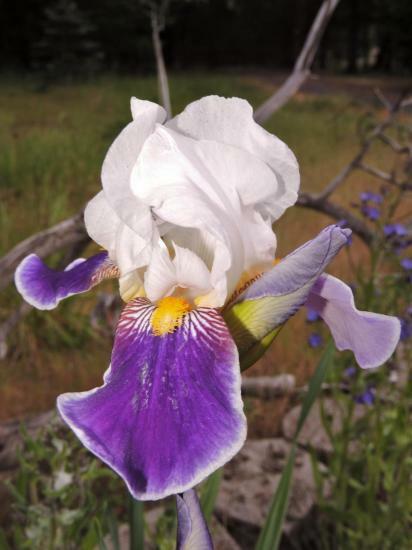 Historically this iris was planted on graves. 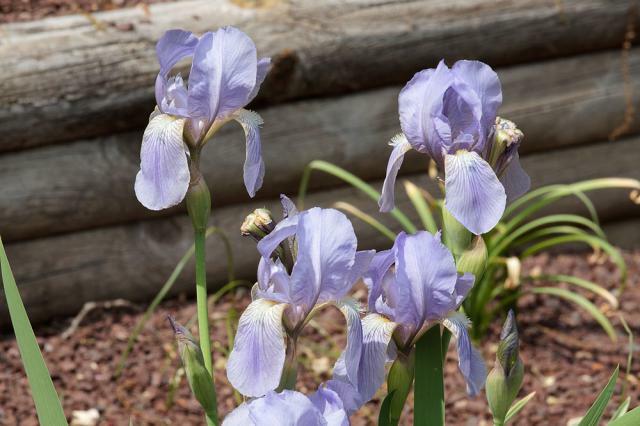 Cemetery iris flowers in March and April, and tolerates dry summer conditions. Growing 15 to 24 inches tall, it spread to Africa and later to Spain and Europe. It is sterile, and spreads through rhizomes. 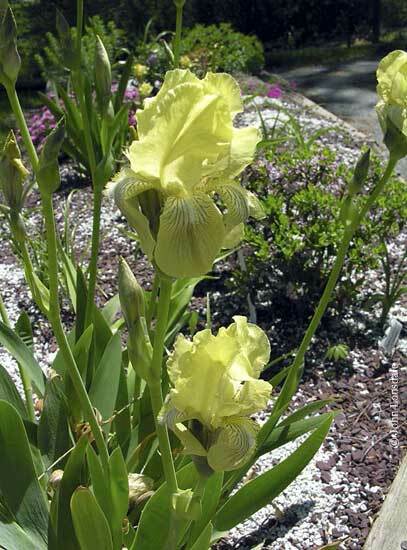 It grows in many countries around the world and in the southern and midwest United States. Photos by John Lonsdale. 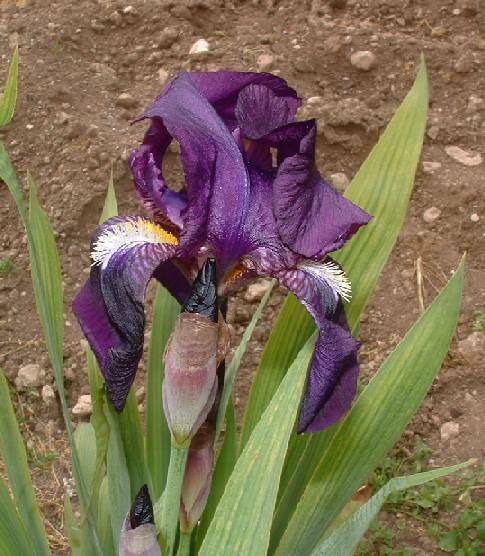 Iris attica is a dwarf species from Greece, Yugoslavia, and Turkey. 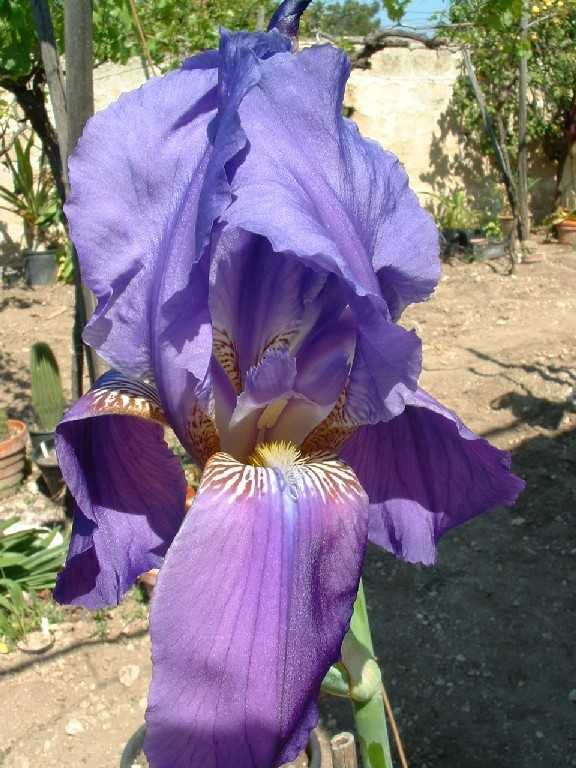 It has bright blue beards with various colored flowers. Photos by John Lonsdale and Hans Joschko. 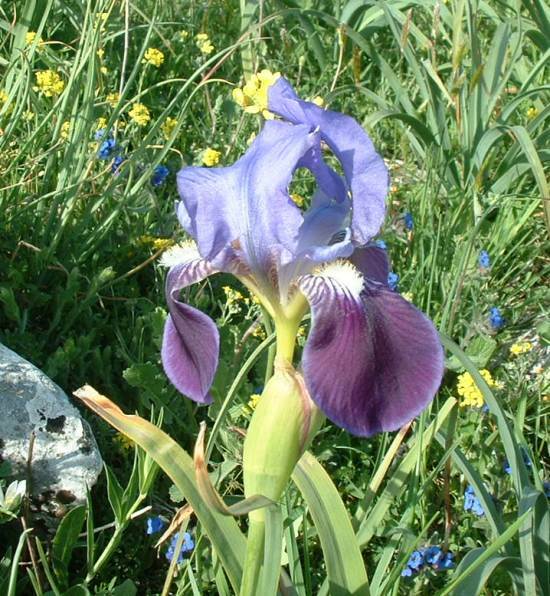 Iris bicapitata is a medium bearded species endemic to the Gargano peninsula in northern Apulia. 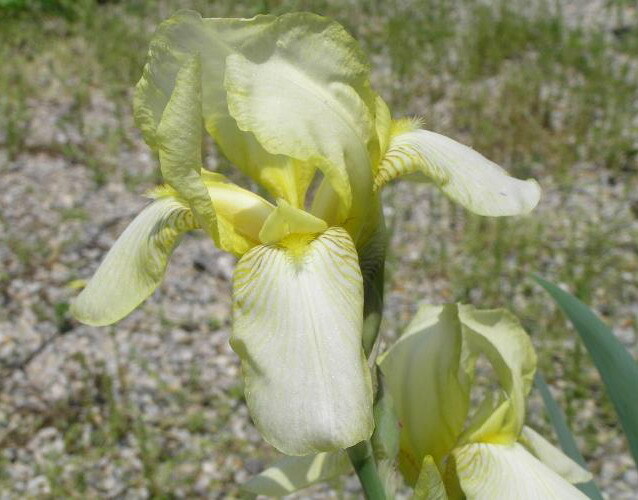 This species has been for a long time confused with the related but smaller Iris lutescens which occurs on the other side of Italian peninsula and has only recently been understood and described as a valid species. I. bicapitata bears two nicely scented flowers atop of the 30-40 cm stalk, hence the specific name. 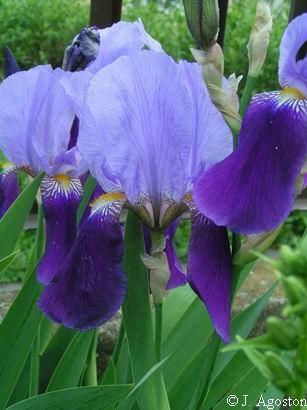 The flowers open in succession of a few days or even together. 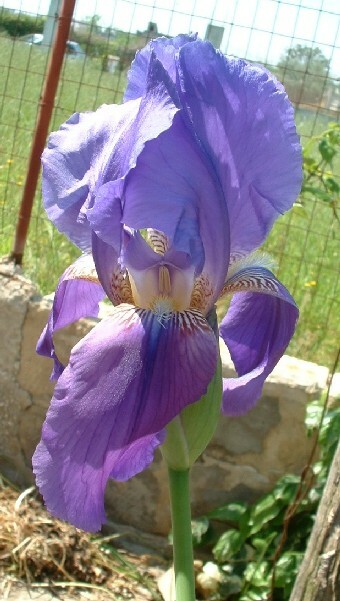 It is normally seen in the deep violet form but uncommon colour variants exist, with combinations of yellow, white and violet in the standards and falls. All photos in habitat by Angelo Porcelli. In his experience, this species takes to cultivation exceedingly well. 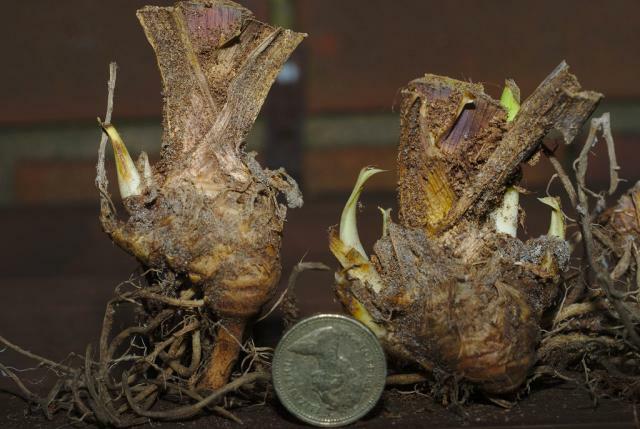 His plants start to flower intermittently from November to March and turned into large clumps from single rhizomes in just two seasons. Shown below are some of the varieties. 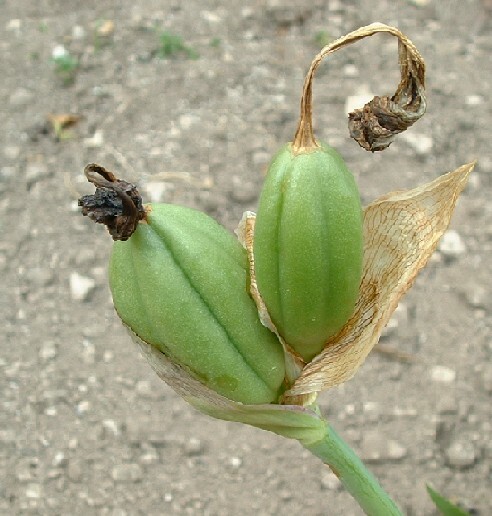 First the typical form followed later by double head seed pods. 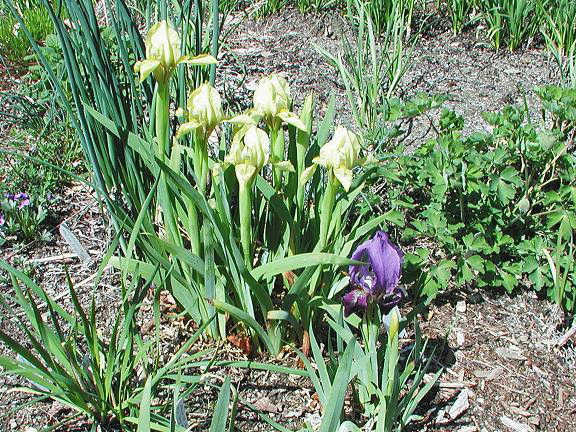 Then a couple of yellow forms, the second with nice yellow standards, one with dark violet falls with a picotee margin, and one with pale blue standards and violet falls. 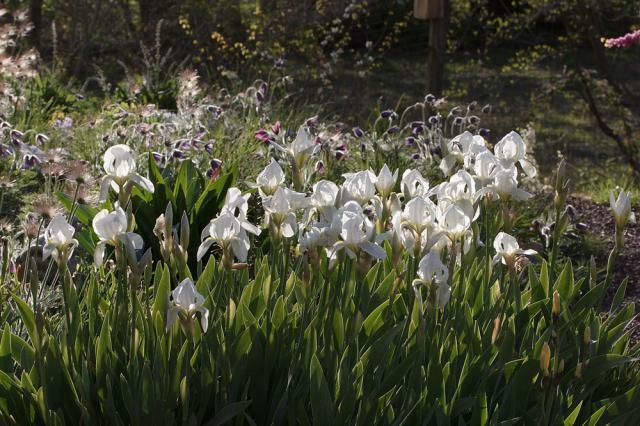 More variations including a pure white form, one with white standards and pale violet falls, a gray-lavender, and finally a vigorous clump. 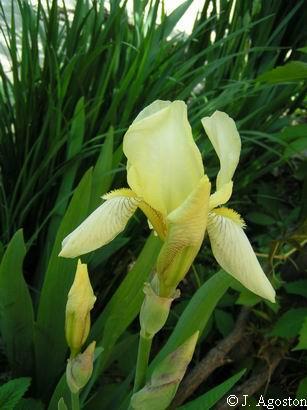 Iris × flavescens, lemon-yellow iris, is a cultivar of collected, probably hybrid, origin. It is seen along roads in Kansas, in Ohio, in old yards, cemeteries, sometimes just scattered. In Jim Waddick’s words, it is "old, sturdy and long-lasting." 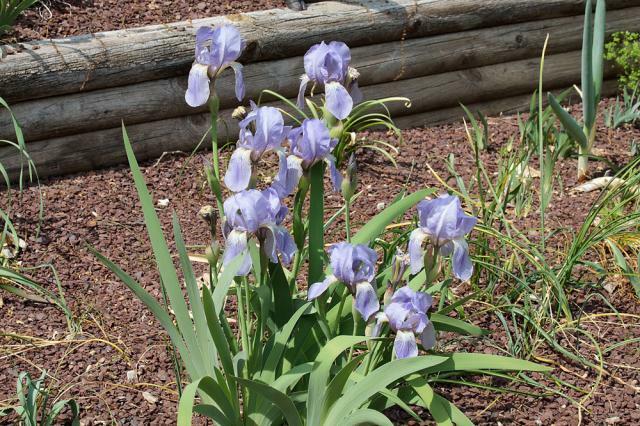 Dennis Kramb gave plants that are probably this hybrid that had naturalized where he lived the name 'Wild Lakota'. Photos from Dennis Kramb and Janos Agoston. 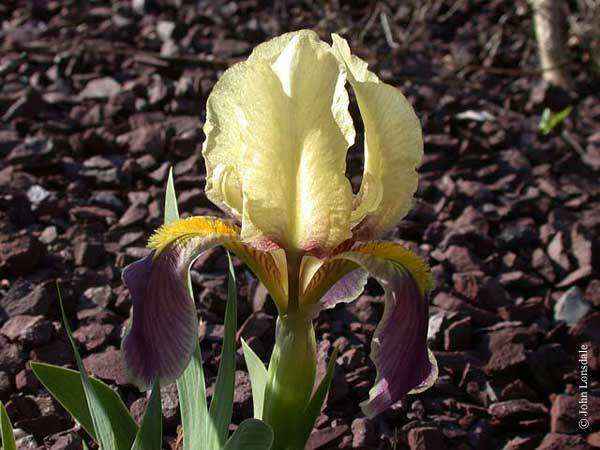 Iris germanica is an European hybrid that became the basis for many tall bearded varieties. 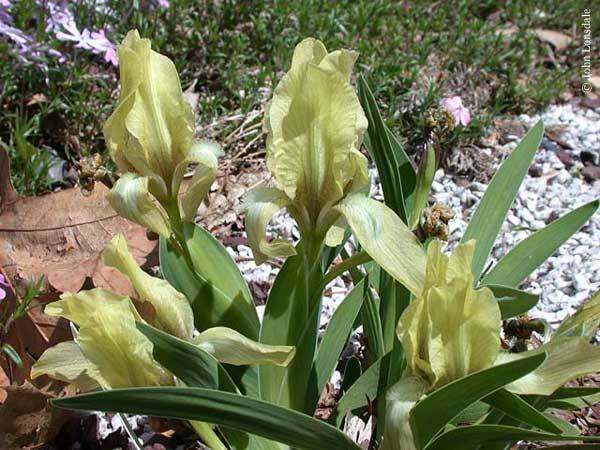 It persists after cultivation in many old gardens in eastern North America, the Midwest and West Coast; WHZ 3-8. 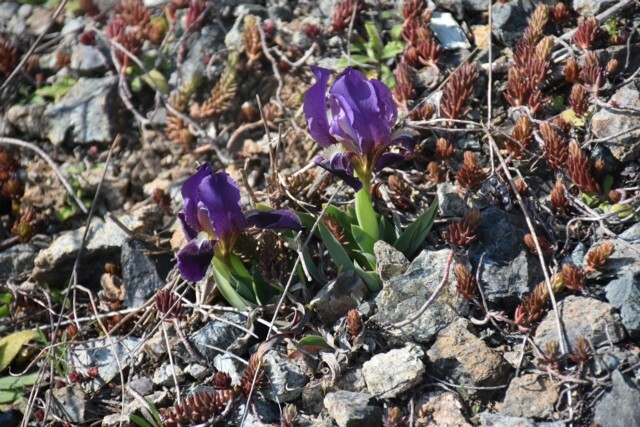 Brian Mathew notes that it is probably not a true wild species, but a natural hybrid; WHZ 3-8. Photos 1-3 from Janos Agoston. Photo 4 from David Pilling, the coin is about an inch in diameter. 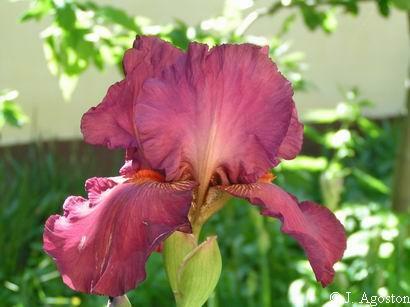 Iris germanica 'Wabash' was bred by E.B. Williamson in 1936. 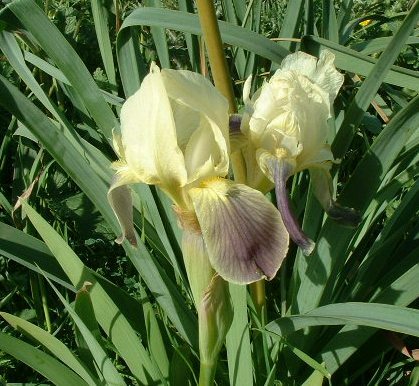 It has won a handful of awards and is one of the most popular in the tall bearded class, still frequently sold to this day. 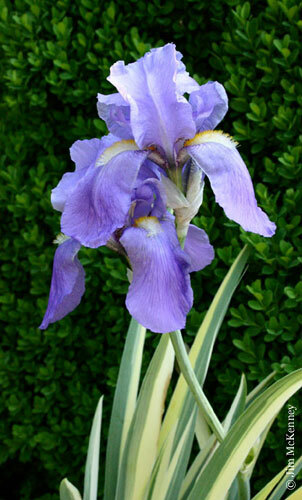 Plants are distinguished by white standards and dark purple falls edged in white. The beards have little to no white. Photos by Travis Owen. 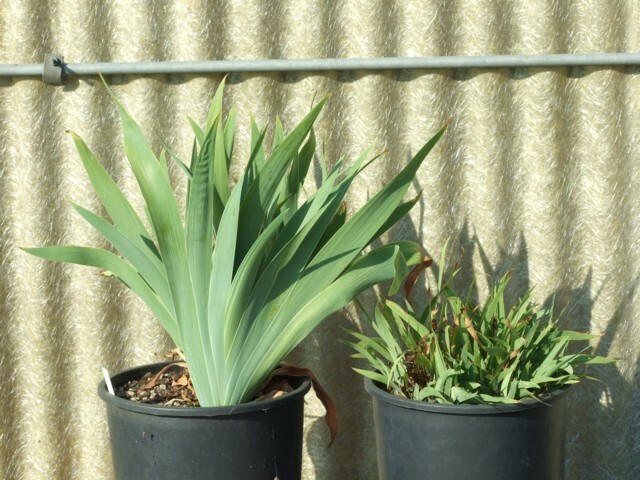 Plants pictured below had not bloomed for several years, yet when transplanted to a sunny location in fertile soil flowered vigorously. 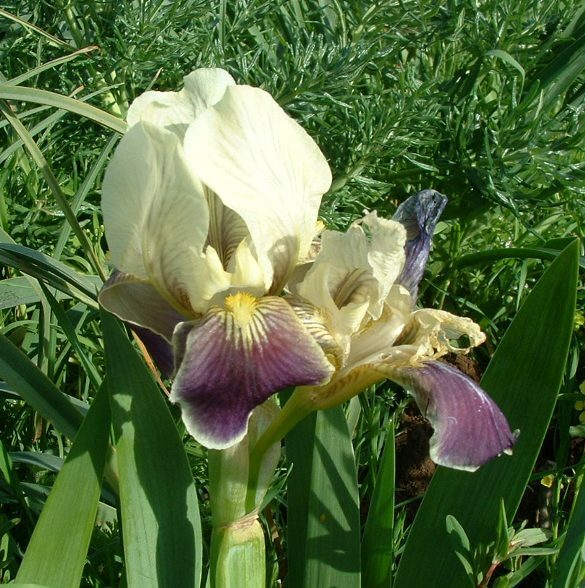 Iris kochii is supposed to be an Italian species, but actually it's a sterile ancient hybrid, belonging to the medium bearded Iris. The plants I have seen so far appear to be virused, but flower and spread happily, totally neglected. Photos by Angelo Porcelli. 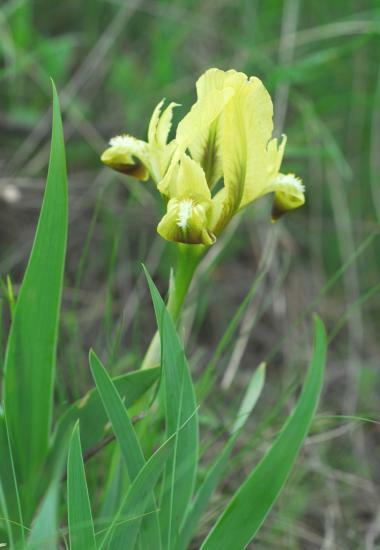 Iris lutescens is a variable species with plants that can range in size from ca. 8 cm to ca. 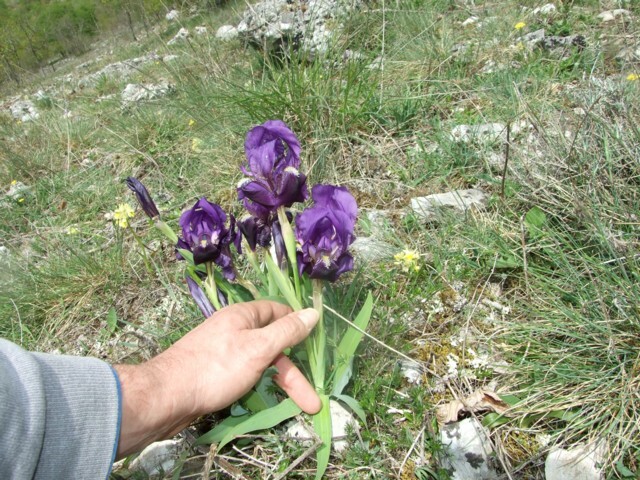 45 cm including the flower. 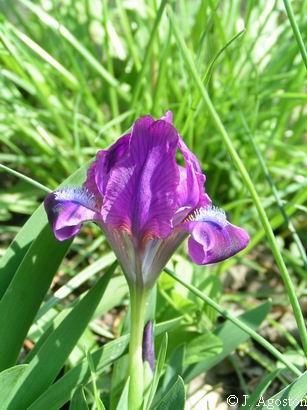 There is usually 1 flower per stem, but in some location we can find plants with up to 3 flowers on shortly branched stems. 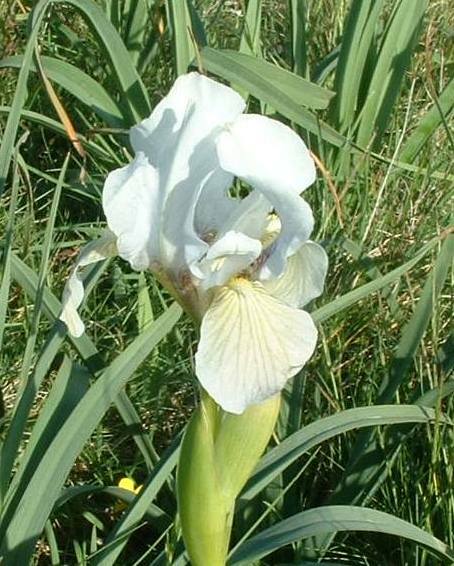 This species is distributed from central Italy westwards to central Portugal. 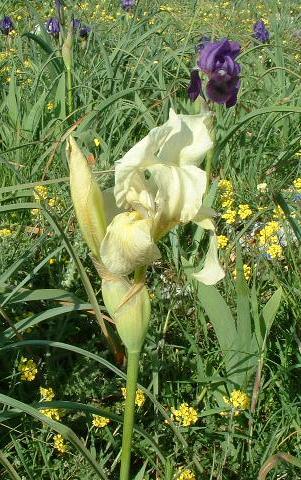 The westernmost populations are usually included in Iris lutescens subsp. subbiflora because their leaf width is over 2 cm, but even wider leaves are found in Tuscany, Italy both in pure wide-leaved populations and in mixed ones. 2n = 40. 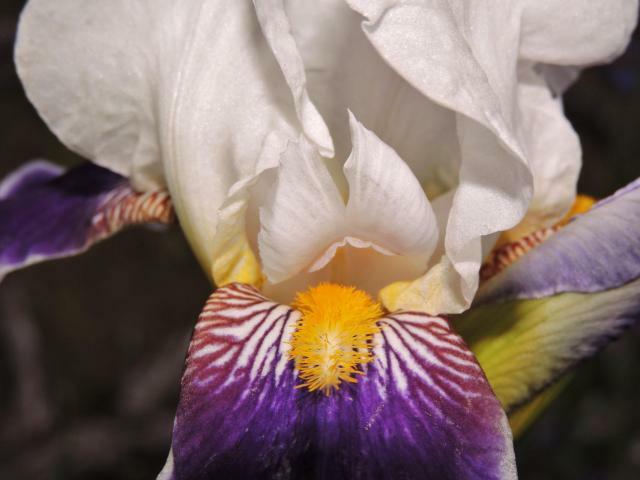 The first photo from Mark McDonough is of two color forms of this dwarf bearded Iris, grown from Mike Salmon seed (collections from Italy and France). The second photo is from John Lonsdale. All the other photos were taken by Gianluca Corazza. 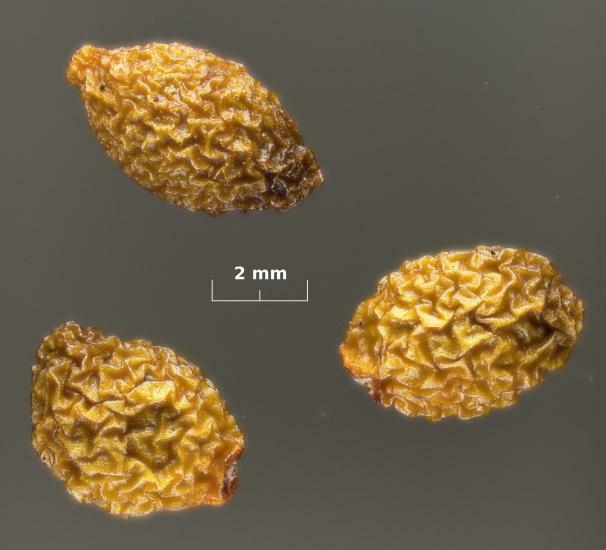 In the third photo he compares the leaf width of a giant and medium form. The rest of the photos were taken in habitat in Tuscany, Italy. 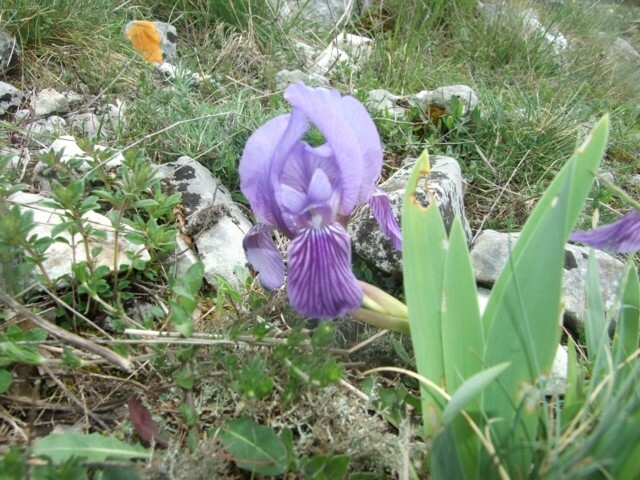 Iris pallida , sweet iris, is native to the Dalmatian coast, former Yugoslavia, and widely naturalized elsewhere. Flowering in mass, in an abandoned homestead in the south of Italy, I estimated over a thousand plants. At a later check, none of these plants have set any seed. Photo by Angelo Porcelli. 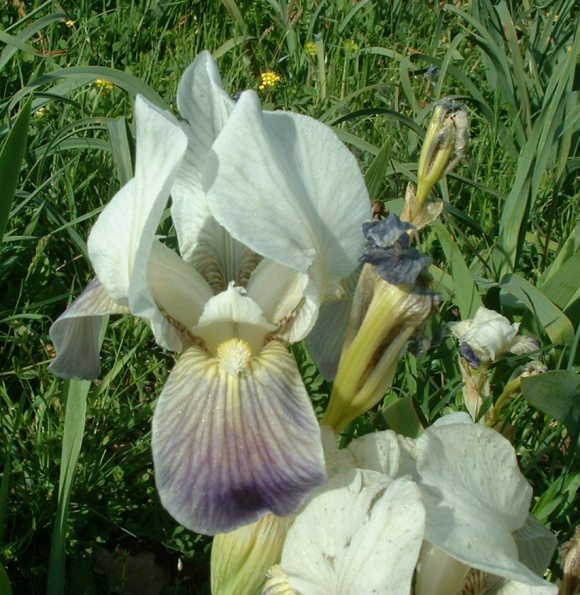 Iris pallida 'Aureovariegata' and a nearly identical form with white variegation are now the most readily obtained forms of this long cultivated plant. 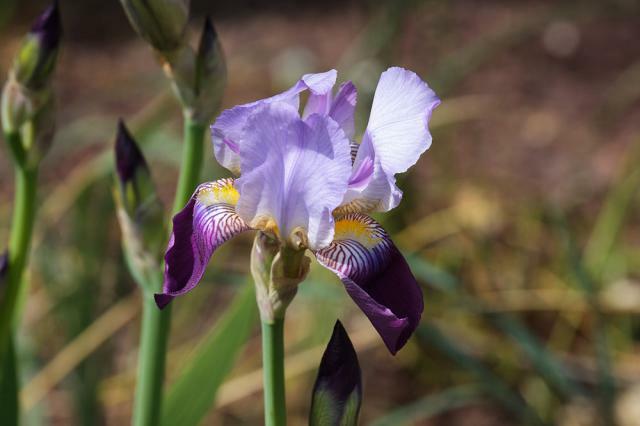 Unlike so many of the old garden irises with botanical names, Iris pallida is apparently a good species. 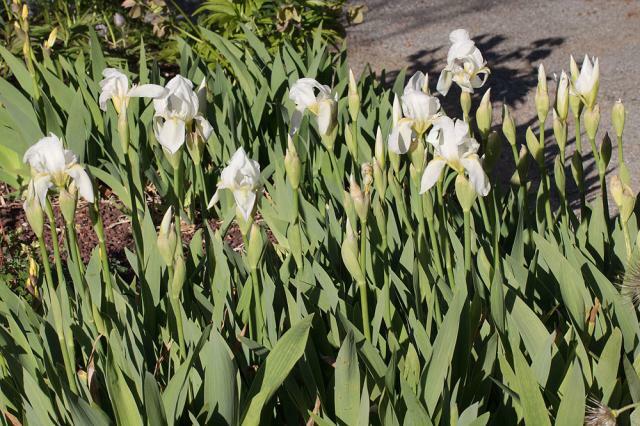 Although small-flowered in comparison to modern hybrid bearded iris, this iris has never lost its following. 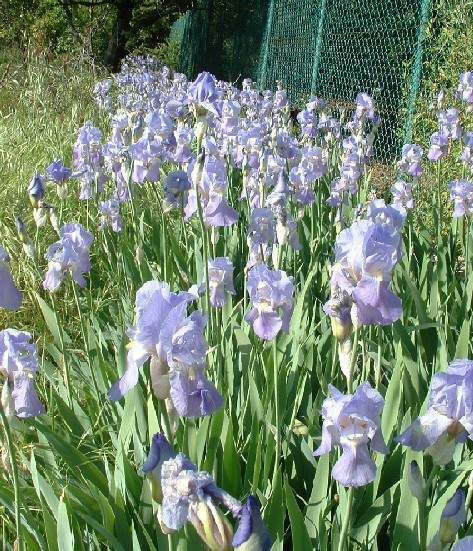 Its wonderful fragrance may be one reason for this, and its early bloom and shining color allow it to be combined with a wide variety of other spring flowers to charming effect. 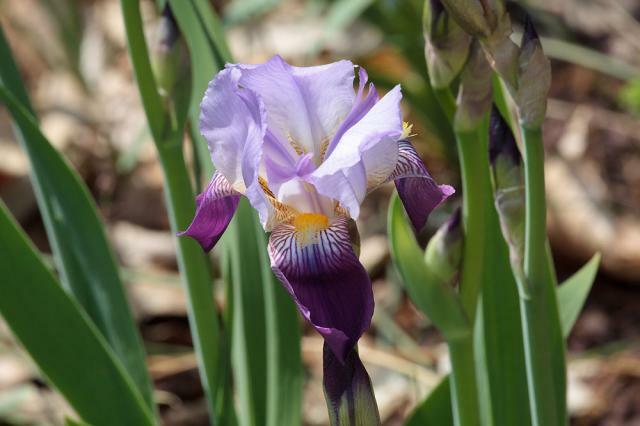 This plant was photographed by Jim McKenney in his Montgomery County, Maryland, USA, zone 7 garden. 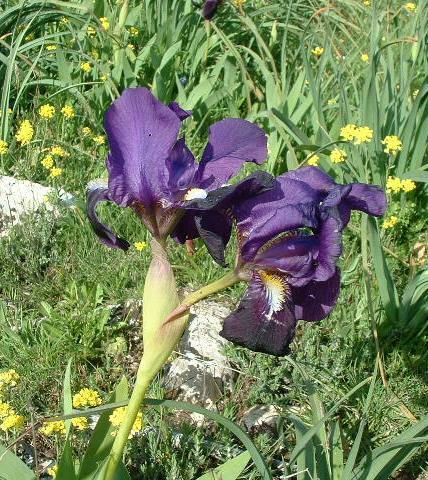 Iris pseudopumila is a dwarf bearded species, endemic of Apulia and Sicily. 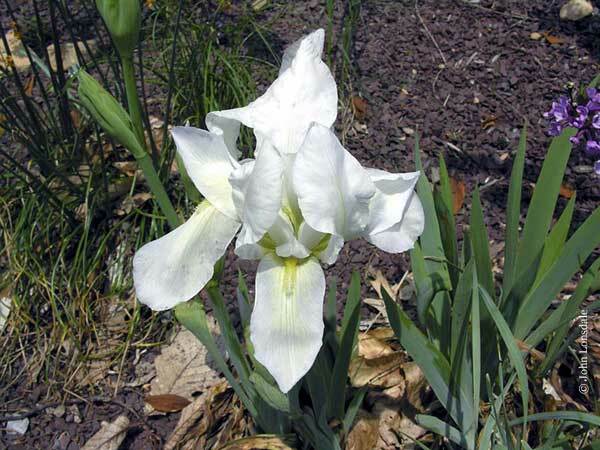 It is thought to be the ancestral form of all the bearded Iris. 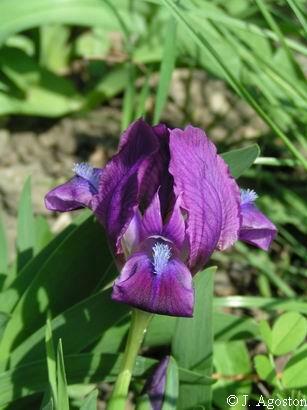 Usually yellow with brown falls, occasionally blue-violet even with intermediate specimens, it is also scentless. 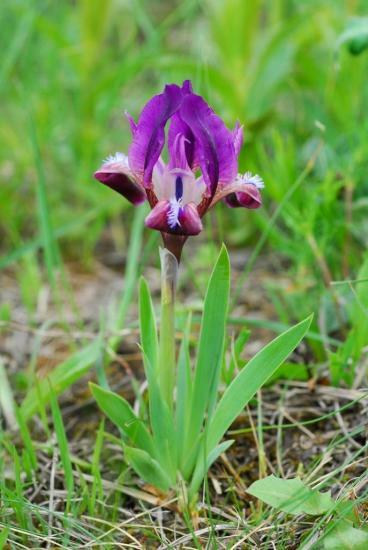 It grows in shallow stony soils and flowers from January to March. This single-flower species is stemless, but the long floral tube acts as stem. 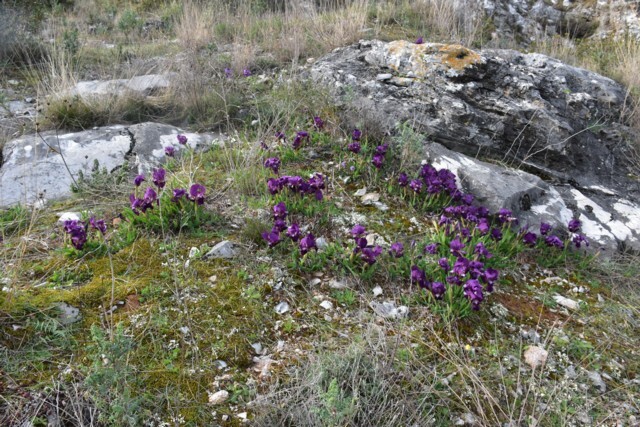 Photo taken in habitat in Apulia by Angelo Porcelli. 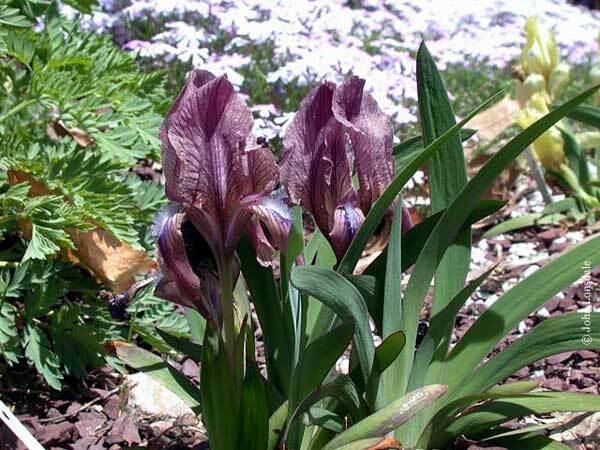 Iris pumila, dwarf iris, is native to central Europe and the Caucasus. 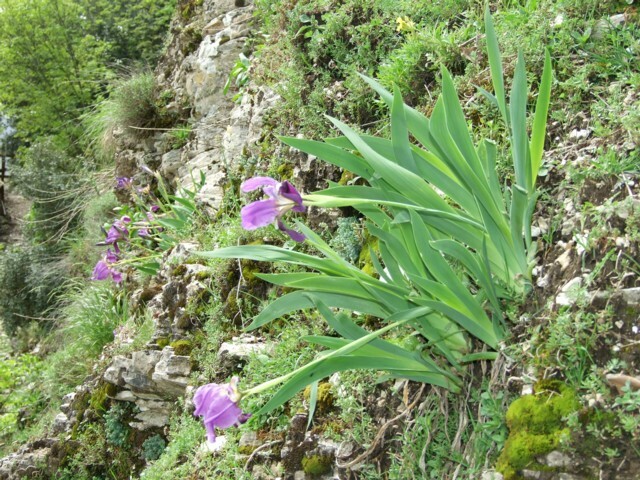 It is a natural hybrid between Iris pseudopumila and Iris attica. 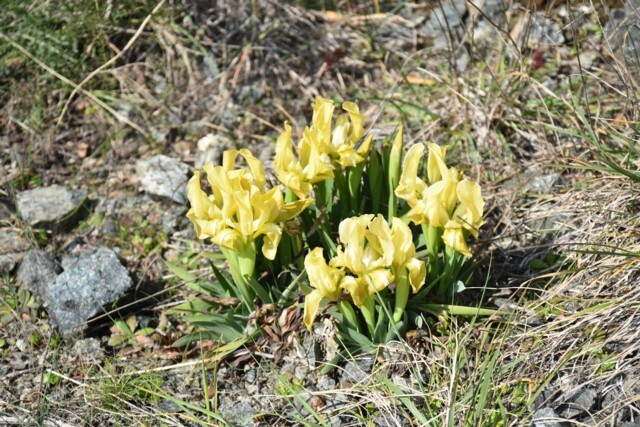 It prefers dry grassy areas, and persists for years after cultivation; WHZ 4-9. Photos 1,2 from Janos Agoston. Photos 3,4 are the two color forms of the species taken in its habitat in Georgia by Oron Peri. Photo 5 of seed by David Pilling. 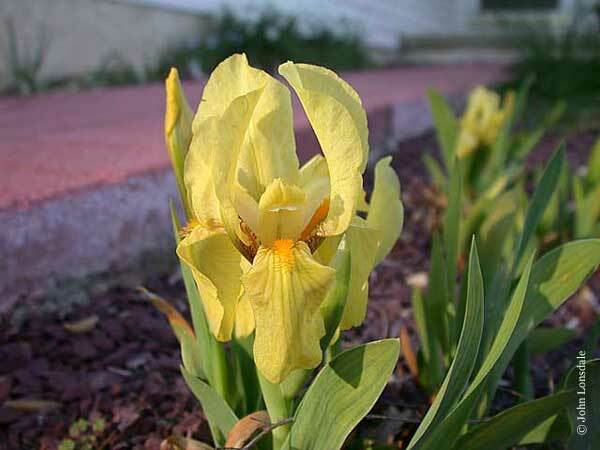 Iris reichenbachii from Greece, Bulgaria, and Romania has yellow or purple flowers. Photo by John Lonsdale. 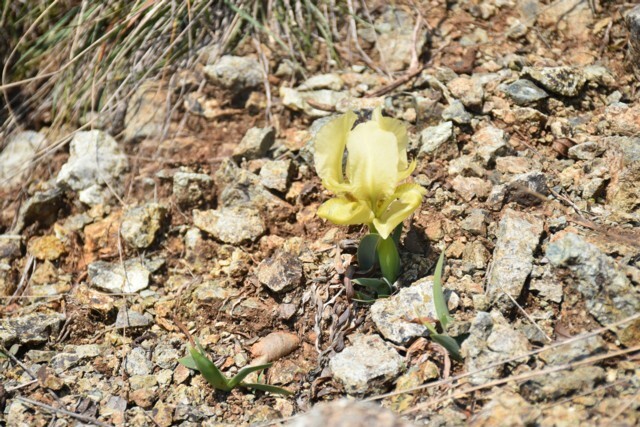 Iris schachtii is a short species with yellow or purple flowers found in central and western Turkey. Photo by John Lonsdale. 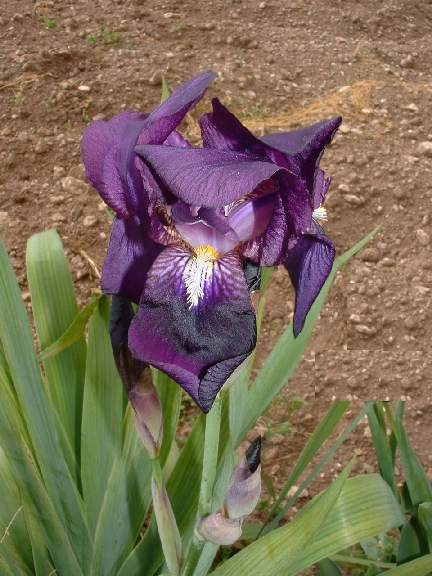 Iris sicula Tod. 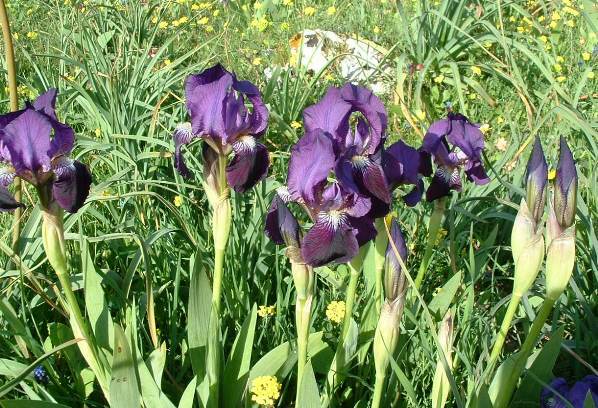 is a beautiful, very tall, bearded species, endemic to Sicily and minor islands such as Pantelleria and Malta. There is still a doubt about this species, but in my opinion it is clearly a valid one. 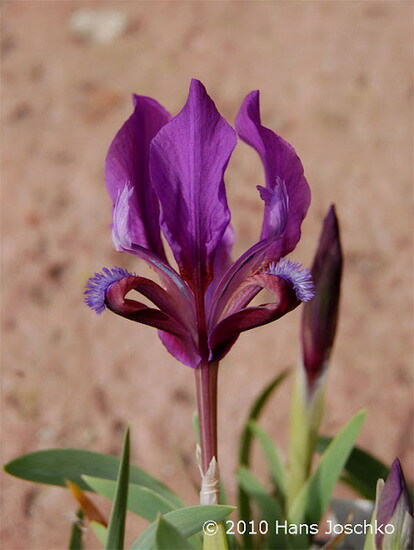 It is vaguely related to Iris pallida according to some Italian botanists, but this is a more robust plant, with large flowers up to 20 cm across and a strong vaguely chemical scent. It is totally summer dormant and the rhizomes are very thick and large, with distinctive leaf scars. These plants set seeds regularly in my yard. Photos by Angelo Porcelli. 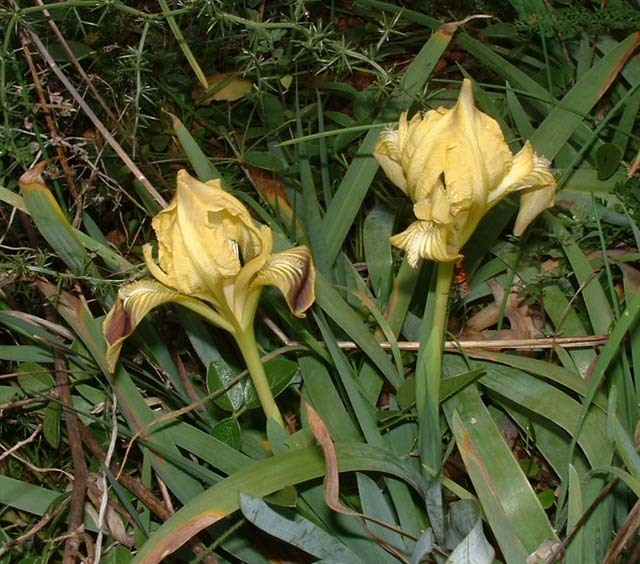 Iris suaveolens , a species from the Balkans to northwestern Turkey has yellow flowers, with or without spots, or purplish-brown flowers with a yellow or bluish beard. Photos by John Lonsdale.